Colorado requires that brokers renew their license through their online system. You will need to register for an account if you do not already have one. What are my Colorado real estate continuing education requirements? Brokers in Colorado are required to complete 24 hours of continuing education each three-year licensing cycle. Half of those hours (12 hours) must be comprised of three different 4-hour Annual Commission Update Course. These courses are only available from January 1st through December 31st of their year and must be completed prior to December 31st. The remainder of the required hours (12) may be any combination of elective credit hours approved by DORA. How much does it cost to renew my Colorado real estate license? How often must I renew my Colorado real estate license? Colorado Broker licenses must be renewed every three years. When do I need to renew my Colorado real estate license? Currently, all Colorado broker licenses expire on the anniversary date of the date of issuance. However, starting January 1, 2018, all licenses will move to a December 31stexpiration date. DORA is currently ironing out the details. I missed the due date for my Colorado real estate license renewal, can I still renew? Yes. Brokers in Colorado may renew their license up to two years past their expiration date. Do I have to complete any continuing education if my Colorado real estate license is inactive? No. If your license is inactive you do not need to complete any continuing education. Prior to the reactivation your license, you will be required to show proof of completion of the required continuing education or completion of the 24-hour Broker Reactivation course. 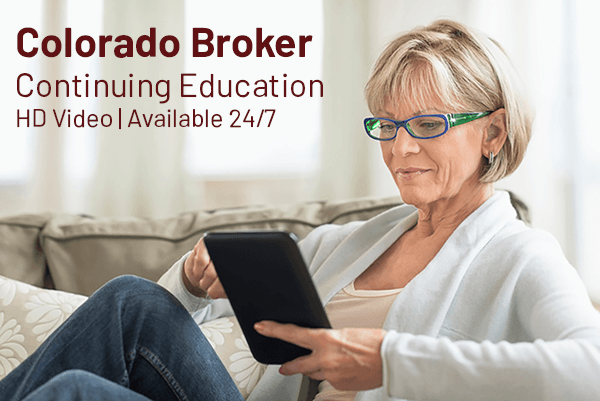 Where do I find Colorado approved real estate broker continuing education? Real Estate Training Institute provides online video courses that are approved by the Colorado Division of Real Estate & Available 24/7! Are your courses approved by Colorado Division of Real Estate? Yes! Our course approval numbers are included in the course title. Individual courses are available for six months from the date of purchase. The purchase of a package will give you access to the coursework for the full length of your licensing cycle (3 years). A note about the Annual Commission Update course – per Colorado Department of Real Estate requirements, the Annual Commission Update course is only available during the calendar year that course pertains to, and it must be completed prior to December 31st of that year. For example, the current 24-hour complete package includes 2017, 2018, 2019 Annual Commission Update courses in addition to 12 elective hours. Only the 2017 Annual Commission Course has content that is available to be reviewed, and it must be completed prior to December 31, 2017. On January 1, 2018, the 2018 Annual Commission update will be made available to you, and the 2017 Annual Commission update will no longer be available. This entry was posted in Renewal and tagged Colorado Renewal. Bookmark the permalink.